I really don’t understand why so many people dislike his inking, and particularly so on Infantino. Or maybe I do. Maybe it grew out of a failure to recognize Infantino’s strength as a designer, as opposed to strength as a draughtsman. Infantino, more than any other comic book artist, adopted the layout styles of the 1960s. He learned this in an illustration class he took for years at the Art Students League of New York. I forget the name of his teacher. But resultantly, he became comics’ answer to Bob Peak or Peter Amsel or even Peter Max, in that respect. Under Giella’s inks, while the drawings remained naturalistic, they also emphasized the flatness of the page, the pattern of simple shapes. It was perfect for Infantino. I don’t think Infantino understood his own strengths, in that respect. He wanted his work to be inked with a brush, and he wanted mass and weight to be emphasized. You see that in his choice of Frank Giacoia as his favorite inker. The relationship between a penciller and an inker is a complex one, and I know a lot of pencillers detest the people who’ve inked them, but their opinions are not necessarily right. The point being, an artist may not understand why something works, and may sabotage his own efforts as a result. It harks back to an old saying among painters, that it takes two guys to paint a picture: one man to paint it, and another to tell him when to stop. Similarly, Carmine didn’t understand what Giella really did for him. Neither did a lot of other people. Me, I understand it, and I’m grateful to Giella for his body of work. 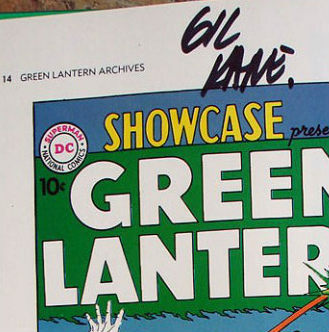 So, in honor of Joe’s birthday and the fact that he kindly signed my Green Lantern Archive Edition #1, which had already been signed by Gil Kane, I thought it was long overdue to revisit GL. By the way, don’t forget to check out Joe’s commissioned piece of GL charging his power ring at the battery on the home page here. 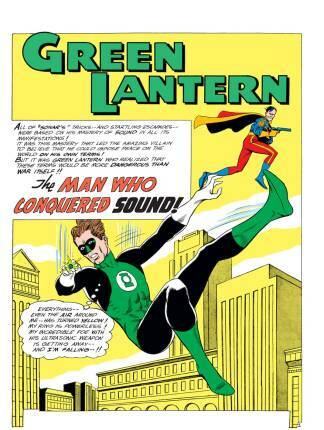 As luck would have it, last month was the 55th anniversary of the first appearance of the villain Sonar from Green Lantern #14 with a publication date of July 1962 in a story titled, “The Man Who Conquered Sound!” Our writer was John Broome. Cover art was by Gil Kane and Murphy Anderson, with interiors by Gil and Joe Giella with letters by Gaspar Saladino and editing by Julius Schwartz. The story starts in an unusual way. Green Lantern is arriving back at earth after a meeting with his fellow GL’s and decides to take a brief European detour. It seems his friend and confidante, Thomas Kalmaku, is an avid stamp collector, but he’s missing one from the tiny country of Modora in the Balkans. Since it’s “on the way,” GL pops in to see if he can find a stamp for his friend, but instead, he discovers, through some power ring probing, that one Bito Wladon may be posing a threat to the United States. Apparently he recently left for the U.S. to pursue an ambitious dream to put Modora on the map via some powerful weaponry he’s working on that will produce the world’s first Nucelo-Sonic bomb, based on Supersonic energy. Through Wladon’s research, he’s already begun to harness the power of sound and this is the next logical step, but he needs some technology unavailable anywhere but America. 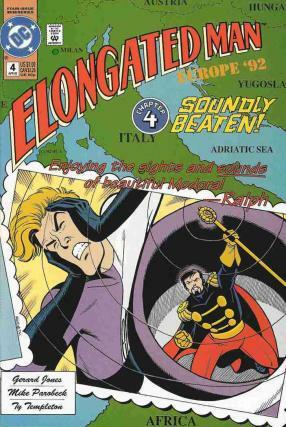 The newly minted villain has already devised a costume for himself, even if it does look a little like a caped band uniform, and by the time GL gets stateside, he’s already reading headlines about this new threat that the press has dubbed “Sonar.” As he canvasses the city, he soon finds his new foe and Bito has a surprise for the Emerald Gladiator when he fires off a long distance punch, backed by supersonic waves that drops our hero like a sack of potatoes (as seen on page 8's original line and finished art). 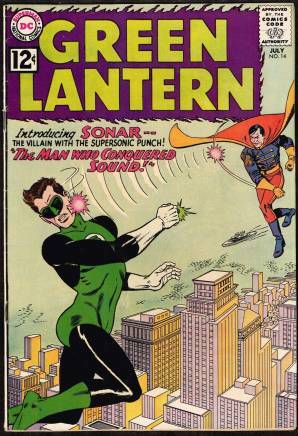 Fortunately the power ring provides a soft and protected landing, but apparently there is more to Sonar than meets the eye. A little later, Wladon is preparing for his next encounter with his handy dandy tuning fork gun which fires supersonic vibrations that are on the same wavelength as the human brain, with the power to bring about mental effects. He gleefully anticipates the next round with our hero. It isn’t long until Sonar’s latest heist is being completed when GL shows up again. 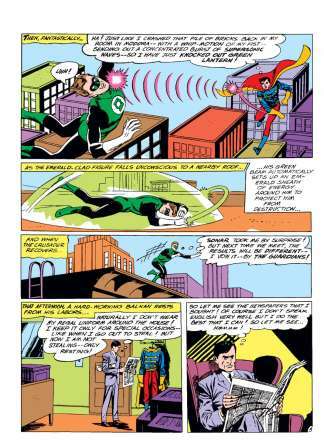 The flying fiend levels the tuning fork gun at Green Lantern and abruptly the world turns yellow, which is the weakness in the power ring, allowing Bito to escape. Before any new tricks can be deployed, Green Lantern takes advantage of the water they’re flying over and soaks Sonar in a power-ring encouraged water spout. Even though he’s been captured, the Balkan is still pleased that he has, indeed, put Modora on the map with his shenanigans. 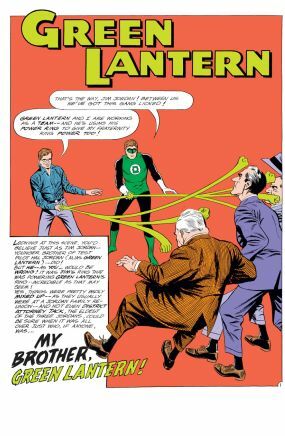 The people of Modora, meanwhile, show their appreciation to Green Lantern, who has brought Wladon home to face charges, by presenting him with a special issue postage stamp, which he later presents to his friend, closing out this 13-page tale. Sonar would show up again from time to time, even bedeviling the Elongated Man (#4, 1992), but he seemed to be something of a second stringer, more interested in self-aggrandizement than anything else. I’ll give this story a 6 on the 10-point scale. It was nothing particularly special, but still a solid Silver Age tale and it’s always enjoyable to learn about a character you’d not been exposed to in the past. 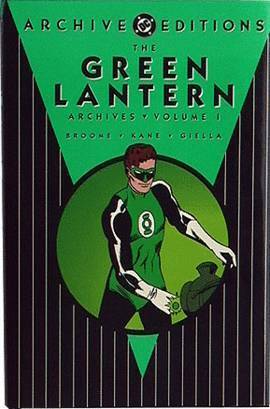 The book's second story, provided by the same creative team, is a Jordan brothers' adventure titled appropriately "My Brother, Green Lantern!" Here’s to Joe Giella, who inked so many key Silver Age characters, from Green Lantern to the Flash to the Justice League and Batman along with so much more. You’ll want to visit us again on the 15th of August for the latest review. You know the way and if you’ve got anything on your mind to include questions or comments, you know how to express yourself, too. Just send an e-mail to me at: professor_the@hotmail.com.